Class used to store required information for the current configuration file. Definition at line 148 of file ConfigParser.h. Definition at line 151 of file ConfigParser.h. 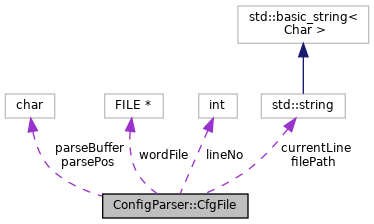 Definition at line 602 of file ConfigParser.cc. Definition at line 558 of file ConfigParser.cc. Definition at line 154 of file ConfigParser.h. References getFileLine(), nextElement(), NULL, parse(), startParse(), type, and wordFile. Return the body of the next element. If the wasQuoted is given set to true if the element was quoted. Definition at line 592 of file ConfigParser.cc. References ConfigParser::FunctionParameters, ConfigParser::PreviewMode_, and ConfigParser::TokenParse(). Do the next parsing step: reads the next line from file if required. the body of next element or a NULL pointer if there are no more token elements in the file. type will be filled with the ConfigParse::TokenType for any element found, or left unchanged if NULL is returned. Definition at line 575 of file ConfigParser.cc. Referenced by isOpen(), and ConfigParser::NextToken(). Definition at line 540 of file ConfigParser.cc. References assert, DBG_CRITICAL, debugs, NULL, and O_TEXT. Definition at line 182 of file ConfigParser.h. Definition at line 181 of file ConfigParser.h. Referenced by ConfigParser::destruct(), and ConfigParser::NextToken(). Definition at line 183 of file ConfigParser.h. Definition at line 178 of file ConfigParser.h. Definition at line 179 of file ConfigParser.h. Definition at line 177 of file ConfigParser.h.